Scary dark gruesome funny bloody horror GNOME-BIE - Zombie lawn yard garden decor gnome evil demon statue, is sure to scare off trespassers… any time, not just as haunted house decor, costume party decoration or Halloween prop. Not even Gnomes can escape the Walking Dead! 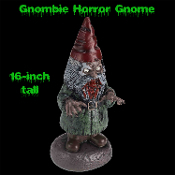 Horrific GNOMBIE figurine, of durable hard hollow plastic resin, stands approx. 16-inches (40cm) tall. Sturdy construction can be displayed indoor or outdoor. Enough painted detail to startle… make you pause… then laugh! Very light weight and creepy, his hands even rotate to ‘’hold’’ small lightweight objects, or can be turned to pose him in a spooky grabbing position, or EAT BRAINS! Got a garden that is just dying for some attention? Then you may want to match it up with some little guys that know a thing or two about making things dead. You may be asking yourself, what purpose could this haunting miniature freak possibly serve on your lawn? Well, for one thing, they can save you the trouble of ever having to utter, ‘’Get off my lawn, you darn kids!’’. Shock friends, family and neighbors with your horrible choice of style in yard decor, or scare off neighborhood strays by placing GNOMBIE strategically in your garden. Sure to frighten all who pass. Horrifying, funny prank joke or gag gift! No lawn, yard or garden is truly complete without a gnome… This berserk creature may be just the look you’ve been after… According to legend, the gnome will protect your garden, but this gnome is different… The addition of this innocent lawn figure can turn into a murderous nightmare, as this pint-sized serial killer takes protecting the garden to a terrifying, relentless extreme… There’s something out to get you… A gore loving, blood-thirsty GNOMBIE, ready to eat the brains of other unsuspecting lawn ornaments!!! ***Please Note: Hollow, durable plastic is lightweight, so to prevent GNOMBIE from ‘’traveling’’ in the wind or rain, you may want to carefully cut or drill a hole in the base, to fill it with sand, pebbles, rocks, marbles, plaster, etc., and re-seal the hole with outdoor glue or even duct tape. Another option is to attach him to a heavy base with screws or outdoor adhesive, or hang him from a tree or post!!! Size: Approx. 16-inch tall (40cm) x 6-inch (15cm) wide x 6-inch (15cm) deep. *Not intended for use in play by children under 14.